Dare To Inspire (DTI), an initiative set up to empower, enlighten and elevate young (Muslim) women presents its second Annual Mentoring Session. The Session provides a platform for young women to observe, interact with and learn from outstanding and established women leaders, experienced business people and leading industry experts. 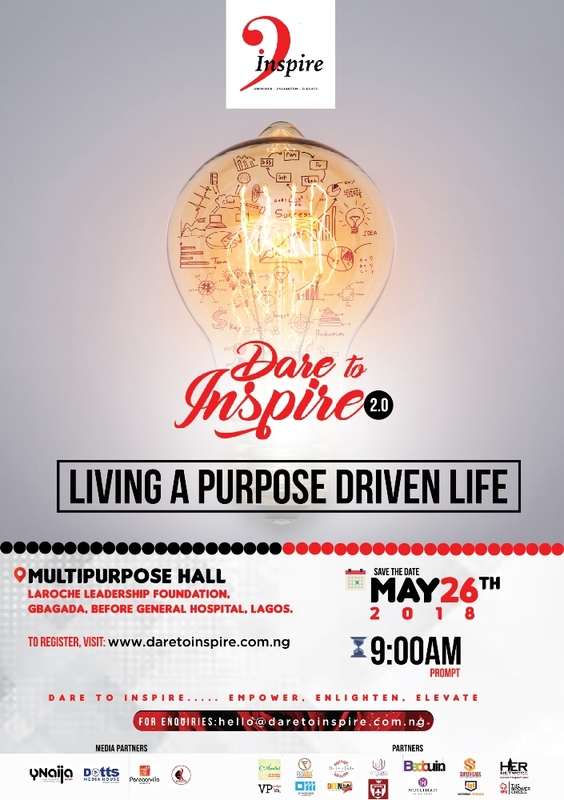 The theme for this second edition is “Living a Purpose Driven Life”. The keynote speaker for the event is the Chairman, Access Bank Plc and Pro-Chancellor/Chairman of Council Olabisi Onabanjo University, Mrs Mosun Bello-Olusoga. Other notable speakers include General Manager, Lagos State Parks and Gardens Agency and Founder of Wecyclers Nigeria Limited, Mrs Bilikiss Adebiyi-Abiola; Managing Director/Chief Medical Director of Madaniyah Women’s Specialist Hospital, Dr (Mrs) Saidat Adetokunbo Badmus; Financial Management Professional in the Oil and Gas Industry, Mrs Halima Garba; Business Strategist and Social Entrepreneur, Mrs Zahra Zakariya Abdulkareem; Founder/Executive Director at She Writes Woman, Ms Hauwa Ojeifo and Director/Clinical Psychologist at Here&After Ghaneeyyah Sulaiman-Olokodana. Speaking at the announcement on Thursday, the convener of the event, Mrs Bunmi Ghiazat Adebimpe said, “I am super excited about this year’s edition as we are going to be digging deep into how our young women can be equipped with the right knowledge and skills to achieve their purpose in life”. She added, “This event creates the opportunity for young women professionals and aspiring entrepreneurs to be mentored, guided and inspired by the success stories and life experiences of our seasoned business leaders”. The maiden edition which held last year was tagged “Empowering the Young (Muslim) Woman”. It had in attendance experienced women leaders such as Mrs Kafilat Araoye (former Group Head HR, GTBank), Mrs Shareefah Andu (Founder, Arabel), Dr. Maymunah Kadiri, (Medical Director/Chief Psychiatrist at Pinnacle Medical Service), Ms Biola Bada (Partner, KPMG) amongst many others. They charged the young women to be the best at what they do and not to feel intimidated or limited by any circumstances they may find themselves in. Date: Saturday, 26th of May 2018. Venue: Multipurpose Hall, Laroche Leadership Foundation, Gbagada (before General Hospital).